If you’re thinking about bringing your pet along on vacation this year you’ll be pleased to know we have many Cape May pet friendly vacation rentals here in New Jersey. We know your pet is your companion and they enjoy traveling too. Pack enough food. If you’re not sure the food your pet regularly eats will be available at your destination then bring some from home. Vacation is not the time to change your pet’s diet. Fresh water. Always carry fresh water, especially if you’re driving here from another place and times when you plan to be outdoors, like on the beach. Essentials. Bring your pet’s bed, food and water dish, and favorite toys and treats. Identification. Be sure your pet is wearing a collar with identification and local contact info on it so he can be returned to you if he gets lost. Leashed. Keep your pet leashed at all times unless your rentals comes with a fenced in yard. Pet Carriers. Pets are safer and more comfortable when traveling in a pet carrier. Let them out from time to time to stretch their legs, relieve themselves and have some fresh water. Carry a photo. Bring a photo of your pet along with you in case they slip away and become lost. A photograph will make it easier for others to help you find him. 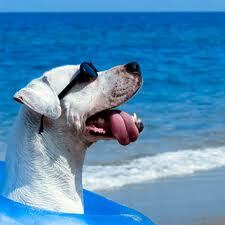 We have many Cape May pet friendly vacation rentals for you to check out. Our website provides a listing of these homes for you to browse through at your convenience.